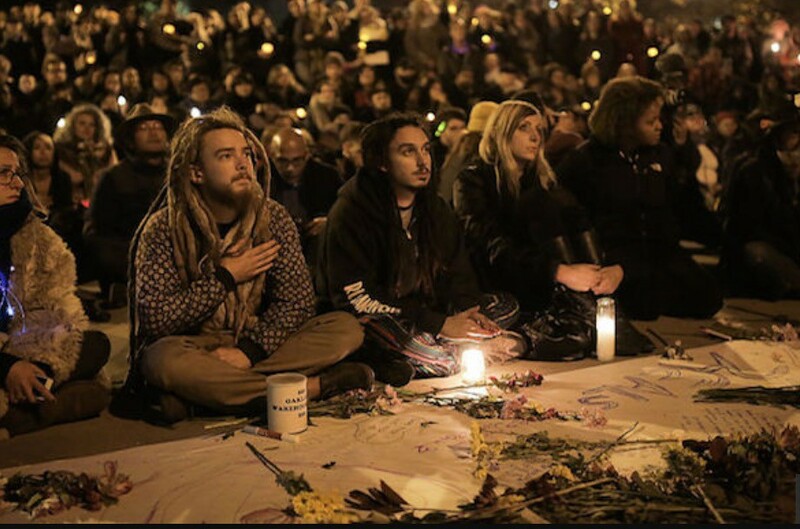 (Oakland, CA) After hearing this was a “rave” I’ve seen some people react with a raised eyebrow and knowing, “Ohhh, well…” as if that somehow explains or makes this tragedy any more comprehensible. I couldn’t quite put words as to why I found that response so offensive. Until now. The people who lost their lives in the Ghost Ship Artist Collective warehouse fire, were victims of a constellation of unfortunate circumstances, including the criminal negligence of a badly maintained building. They themselves did absolutely nothing wrong. Many were artists and musicians, and most were young, living and working in the Bay Area. It’s no small feat to make it work as a creative here, in one of the most expensive places on Earth. You accept crappy buildings and absentee landlords because you simply must in order to live and create and develop your talents. What happened is just horribly, terribly sad. And it is a sad reminder of how marginalized you usually are if you are an artist in the United States. Artists don’t seek out these kinds of risks. They are forced to either live with them or abandon their creative pursuits. We live in a schizoid society that denigrates process and deifies product. We bleed money for the goods creative individuals produce once they’re established. But we do next to nothing -and I mean seriously…nothing- to support those individuals in the interim. No education, no training, no grants, no subsidies, no rental assistance, no significant tax breaks, no safe space to work or live or perform. Yes, there are struggling, anemic programs here or there. But there is ostensibly no safety net and the cuts keep coming to the thin thread that masquerades as one. This is the result of a culture of ever worsening disregard for the arts in general. Artists are treated with either disgust or as demigods. Nothing in between. The reality is, real working artists are some of the hardest working people you will ever encounter, and a great many are part of the working poor. You know who you are and you know I am speaking the truth. In the ever more culturally impoverished United States, being an artist is staggeringly more difficult than in numerous countries where artists are supported and celebrated as culture makers and shapers, not derided and characterized as self indulgent hacks and slackers unless their single hits platinum or they get millions per role. In Germany, $20 per taxpayer goes toward arts funding. In the US, that’s a whopping $0.43. Per year. In the UK, annual funding for museums alone is around $728 million. That’s nearly 5 times the entire $146 Million budget of the US National Endowment for the Arts. Arts Council England also receives both National Lottery funding and direct government (‘grant-in-aid’) funding that totals roughly $768 million. The budget of the French Ministry of Culture is more than $10 Billion — yes — with a “B”. Northern Ireland, with its population of less than 2 million people, awards over $21 million annually for arts, literature and theatre projects. In South Korea, the Culture Ministry committed over $50 Billion(!) toward the development (and often training and housing) of Korean musicians, performers and artists with a goal of proudly promoting Korean arts and culture abroad. That amount represents a lowball of the initial investment South Korea made in the Korean Wave. But their budget for 2017 is around $7 Billion, just behind France. Mexican artists can pay their taxes with artwork in an ‘art for amnesty’ type of exchange. The Mexican government then displays the work in museums and government offices. Among other sizable benefits for artists, Finland allocates $45 million toward the arts for its 5.3 million citizens. We are bested by Uzbekistan and the Balkans. In the US, since Reagan started the process of gutting the NEA, artists have been systematically denied both access to critical resources and the cultural legitimacy of what the rest of the world understands as an enormously important, valuable contribution to society. The struggle is very real and the risks are often so great you simply cannot afford to think about them and expect to have any energy left for your art. So please… I know it’s often an unconscious reflex, but please do not attempt to diminish this tragedy by casting blame on the victims or passing judgement because this was a rave and these were artists who shouldn’t have been living in a rabbit warren of a fire trap. Don’t. Not even for a millisecond. Just mourn this enormous and heartbreaking loss. And mourn that we live in a culture that doesn’t better support artists and musicians like the many poor souls who perished in the Ghost Ship fire. May they rest in peace.